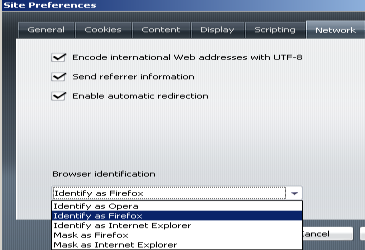 Also known as user agent spoofing, here are 2 ways to fake Opera’s user agent string so that it will identify itself as Internet Explorer or Firefox. There are some sites which are made only for Internet Explorer or simply don’t support Opera yet and stop loading when you visit. This annoys me sometimes since Opera is my default browser. Again, there are only 5 options. Enter a number from 1 to 5 (refer to the list above), and press save. As you can see, you can spoof Opera user agent string easily using either one of the method above. Note that there is currently no Safari or Chrome user agent spoofing in Opera yet since Internet Explorer and Firefox are understandably the 2 internet browsers with the largest users worldwide. The real reason is that this identify / mask feature is to solve browser sniffing bugs websites causes in Opera. There’s no need for Chrome or Safari for this thing, identifying as IE or Firefox might make the website work correctly, it’s enough. thank you sir. Love opera and hate everything else. No i have no further need to use anything else. wow thank you so much!!! great help! I must work with a site that wants IE 8 or OLDER! Problem is Opera 11.5+ spoofs IE9. Is there anyway to have Opera latest Opera spoof IE8 instead? When is Opera going to allow CUSTOM user agent strings? I’ve been waiting for YEARS for this improvement… Why the restriction to a limited set of browsers?